Mention Kendal castle to my husband and he immediately thinks of weekly cross-country runs from Kendal Grammar School! But there is more to the history of this castle than his reluctant running. Thought to date back to the twelth century, the Castle is rumoured to be the birthplace and home of Katherine Parr, the sixth and last queen of Henry VIII. One of the towers and a number of castle walls have survived along with remains of the Manor Hall, which is thought to be one of the most important buildings. Two vaults stand complete under the Hall. Castle Hill was bought, for 'public enjoyment' by Kendal Corporation in 1897, to celebrate Queen Victoria's Diamond Jubilee. 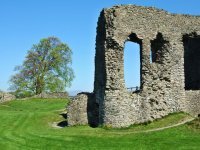 One of the great things about Kendal Castle is that it is easily accessible from the town. There are great views from Castle Hill, and easy wooded walks along with interesting sculptured seats by the artist Alain Ayers, make it a perfect spot for a picnic. 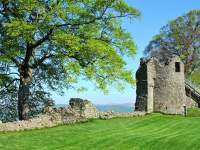 To find out more about the history of Kendal pop along to the Kendal Museum which has a reconstruction of the castle and an exhibition depicting the story of the Castle and its people. Read more about the historical market town town of Kendal. Looking for a tasty picnic? Lower Sizergh Barn* farm shop is a great place to stock up on tasty treats for your picnic. The farm shop sells wonderful home made cakes and the organic Cumbrian produce is perfect to supplement your self-catering week in The Lakes. This organic Cumbrian farm also has a lovely little tea room with a window into the milking parlor - if you are lucky you may get to see the cows being milked! For more details of the local produce available at Lower Sizergh farm shop and for opening hours read more here.